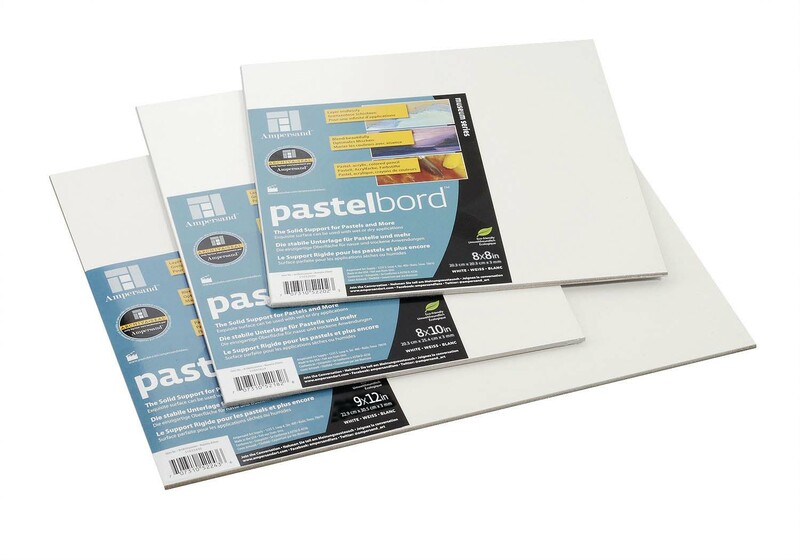 Pastelbord is a clay and gesso coated hardboard panel with a granular marble dust finish comparable to a sanded pastel paper, except more durable and more versatile. Pastelbord can be used with wet or dry traditional pastel techniques, pastels blend beautifully and colours stay rich and vibrant. The coating is pH neutral and non-yellowing, making it a truly permanent museum quality surface. The acid free surface holds more pastel layers than any other surface. Also a perfect surface for bold seamless washes of acrylics. Acrylics stay wet longer than on a gessoed panel or canvas allowing more oil paint-like blending techniques. If using this product with acrylics it suggested you should start by wetting the board first before applying the paint. Pastelbord also allows the colour of your painting to reach an intensity unattainable on any other surface. Pastelbord is available in Gray and White in sizes from 5x7" to 16x20". £3.54 Pastelbord Gary 5x7- 1/8"
£10.00 Pastelbord Gray 11x14 - 1/8"
£10.54 Pastelbord Gray 12x12 - 1/8"
£16.83 Pastelbord Gray 16x20 - 1/8"
£7.04 Pastelbord Gray 8x10 - 1/8"
£5.88 Pastelbord Gray 8x8 - 1/8"
£8.79 Pastelbord Gray 9x12 - 1/8"
£10.00 Pastelbord WHITE 11x14 - 1/8"
£10.54 Pastelbord WHITE 12x12 - 1/8"
£16.83 Pastelbord WHITE 16x20 - 1/8"
£3.54 Pastelbord WHITE 5x7 - 1/8"
£7.04 Pastelbord WHITE 8x10 - 1/8"
£5.88 Pastelbord WHITE 8x8 - 1/8"
£8.79 Pastelbord WHITE 9x12 - 1/8"
Pastelbord WHITE 16x20 - 1/8"
Pastelbord WHITE 12x12 - 1/8"
Pastelbord WHITE 11x14 - 1/8"
Pastelbord WHITE 9x12 - 1/8"
Pastelbord WHITE 8x10 - 1/8"